Andrew Tozer is a contemporary British artist and one of Cornwall's most respected en plein air landscape painters featuring in collections worldwide ​. Known colloquially as a 'painter of light', he effortlessly captures moments as they occur. Andrew captures light, atmosphere, and the very essence of his subject matter in paintings that manage to conjure memories of the past whilst being firmly in the present. His work is celebratory with a dreamlike quality evoking memories of place and time. 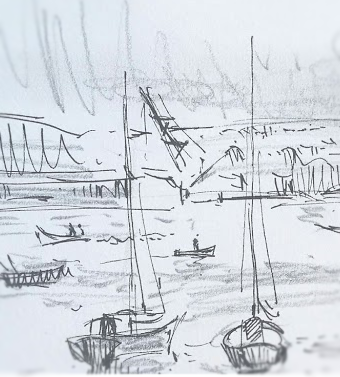 Andrew chooses simple and joyful subjects which move him; boats at rest in a harbour, a figure in the quiet of the studio or precious family moments. Andrew, quite simply, loves to paint what he loves, and considers it to be one of life’s great pleasures.